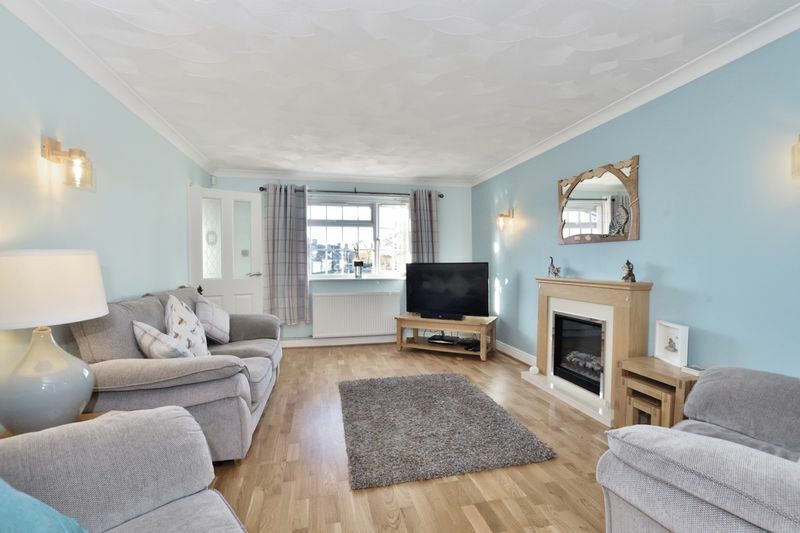 A fantastic opportunity to purchase a modern, spacious and smartly presented detached property, located in the middle of a pretty and sought after village, benefitting from excellent transport links. 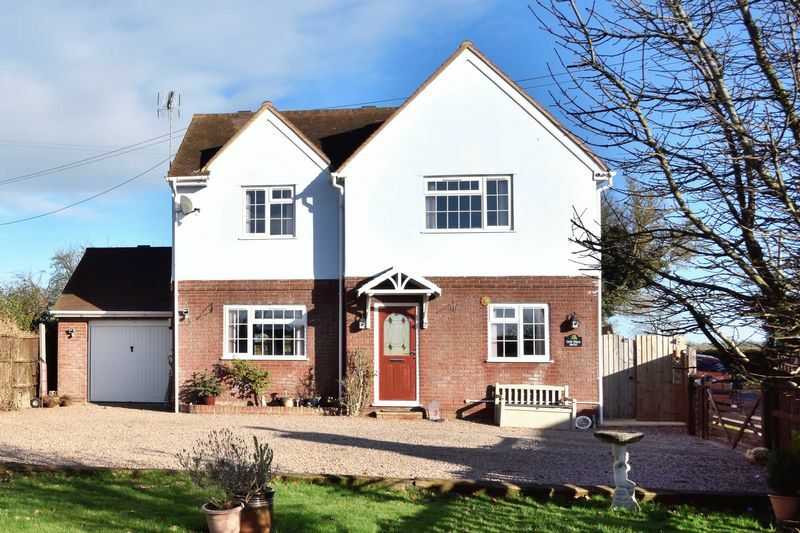 This well presented detached home is conveniently situated on an impressive corner plot and benefits from a gated entrance and front drive with parking for several cars, also allowing easy access for larger vehicles. 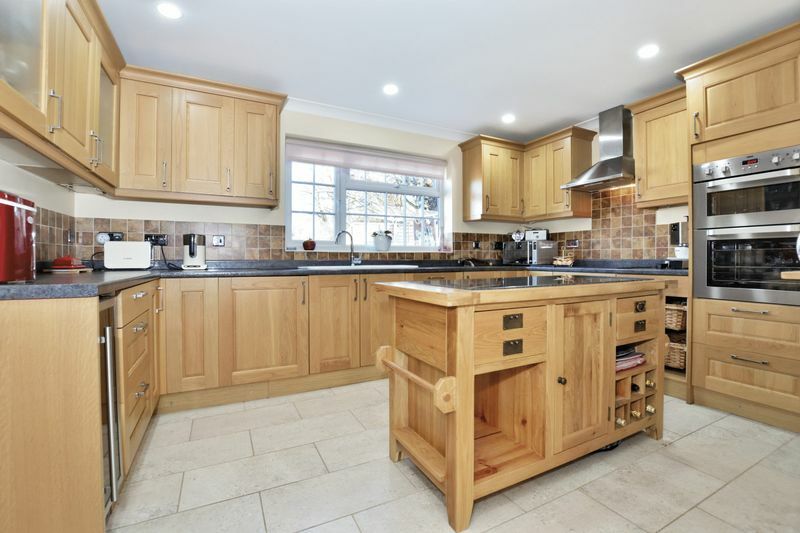 With a pretty landscaped garden to the rear backing onto countryside, the property is bright, spacious and welcoming. 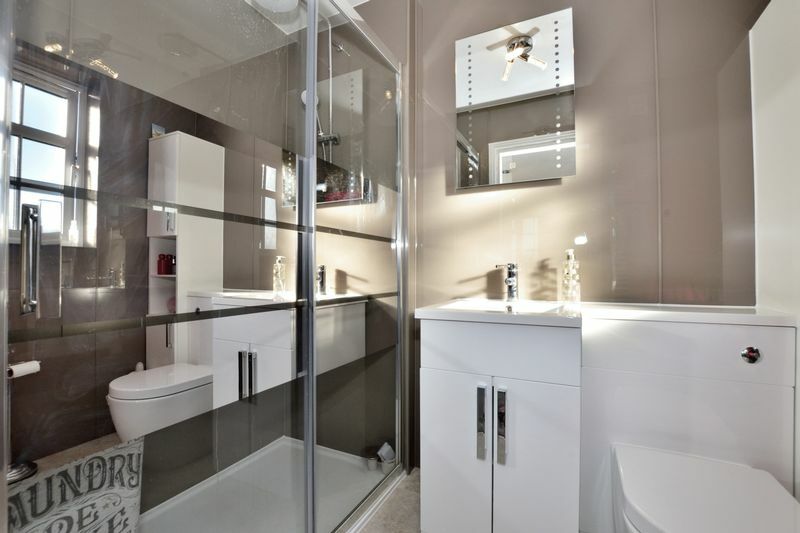 The rooms are well proportioned and versatile for a variety of configurations. 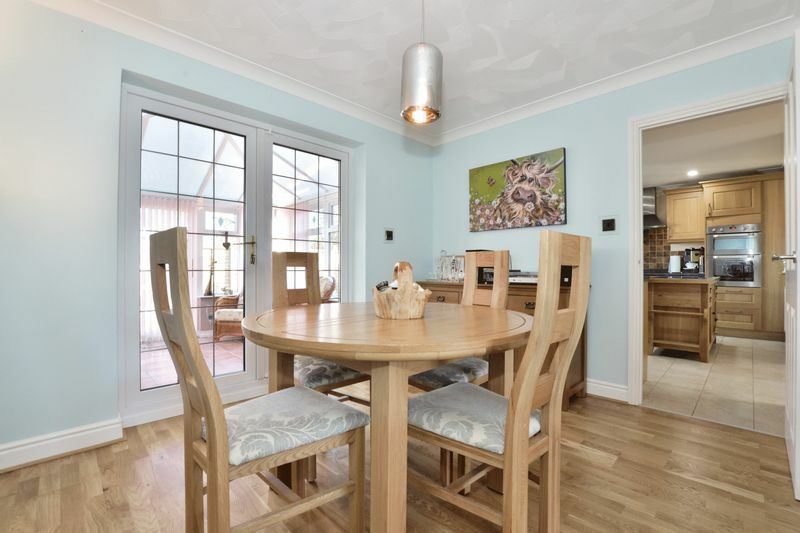 The open plan sitting and dining room flows through to a sunroom, which allows for extra space for entertaining. 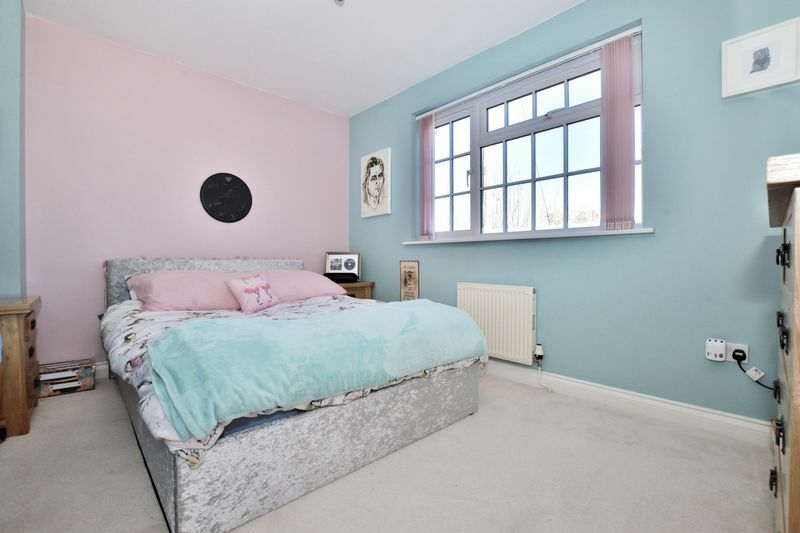 Upstairs 4 double bedrooms lead off a spacious landing area, with the main bedroom having an impressive en-suite in addition to a family shower room. 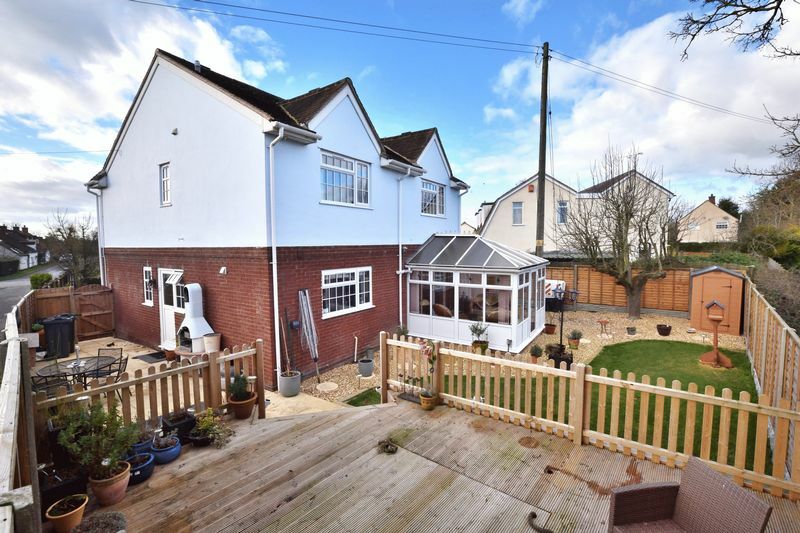 With plenty of space surrounding the house, it is also conveniently situated for anyone wishing to commute with transport links close by. 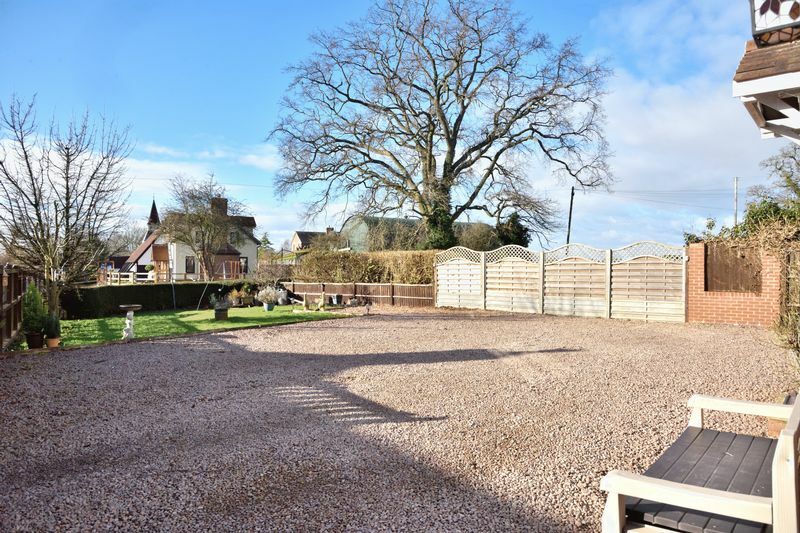 New Cross House is located in the popular village location of Pendock, surrounded by countryside and farmland. 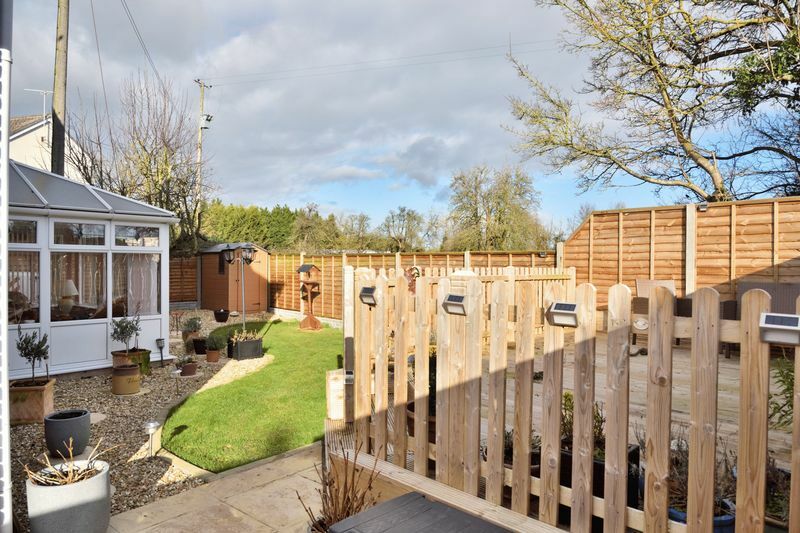 The village borders the counties of Gloucestershire, Herefordshire and Worcestershire and offers fantastic transport links to Birmingham and Bristol, as well as Cheltenham and Gloucester. 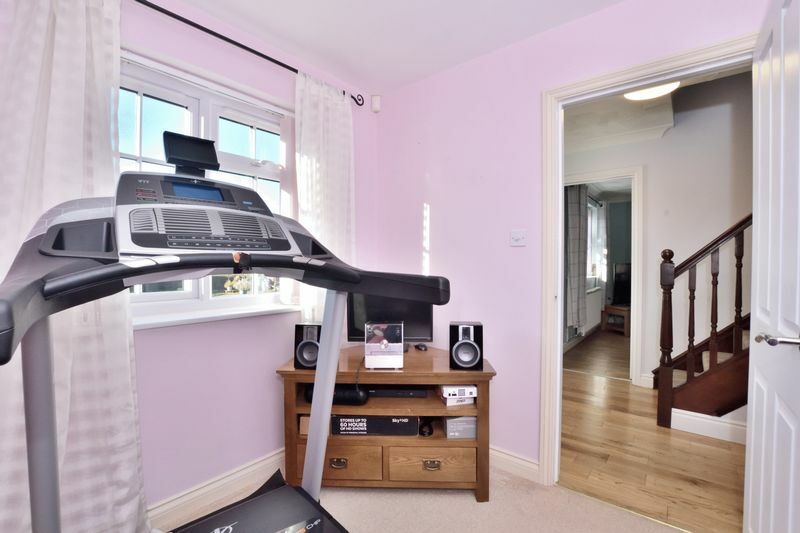 There is a good range of local facilities including a village store, post office, pretty church and charming primary school. 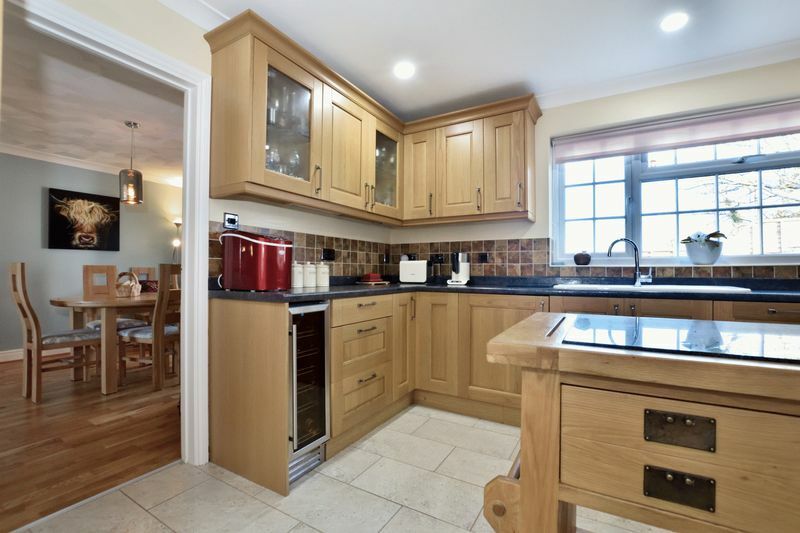 The historical market town of Ledbury is 7 miles away and 9 miles to Malvern, both with a variety of retail and cultural facilities. 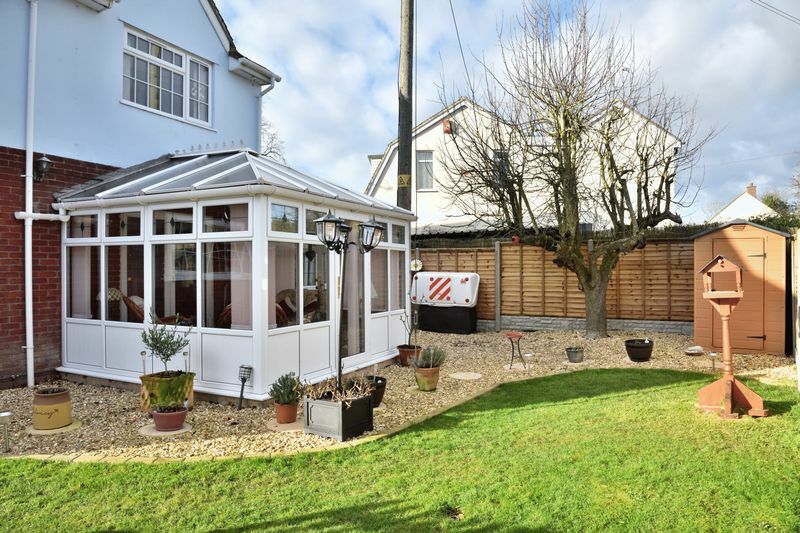 For more extensive opportunities the Cathedral City of Gloucester is 10 miles away. 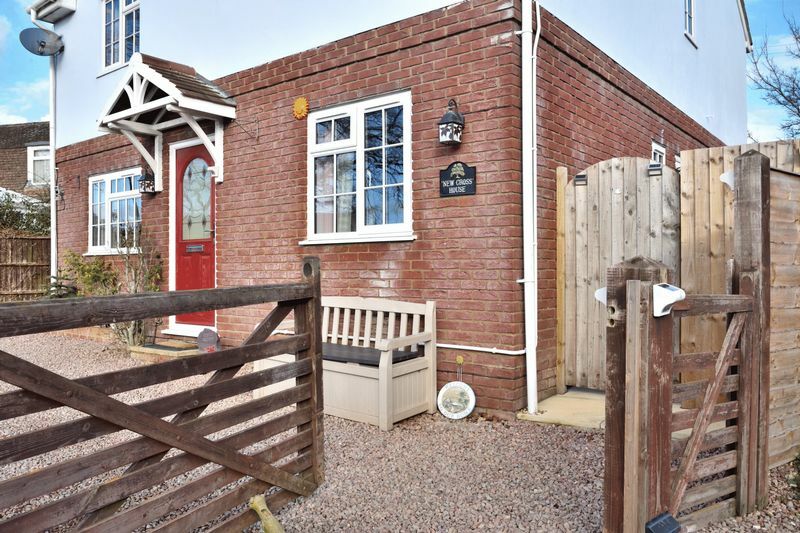 Entrance – Through a wooden gate to the side of the property you enter on to a spacious gravelled hard standing ideal for motorhomes or car enthusiasts and providing ample parking whilst offering good frontage for the property. 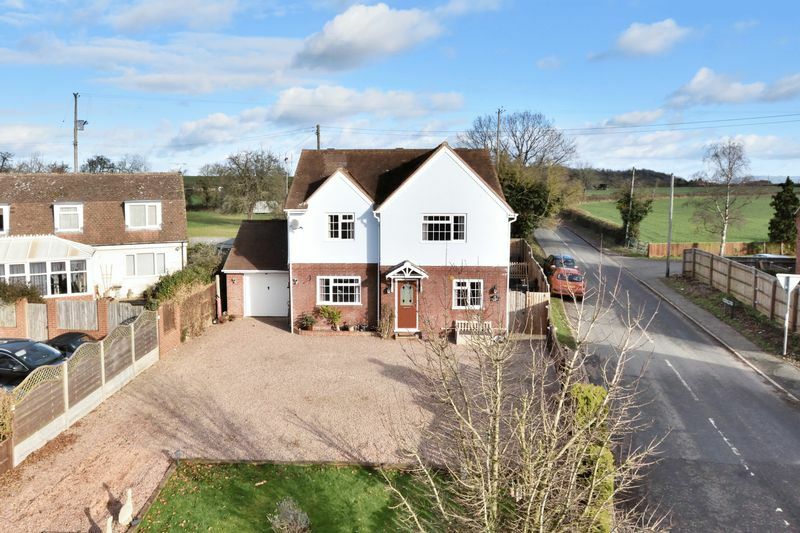 There is a single garage and a large wooden gate opens for vehicular access. 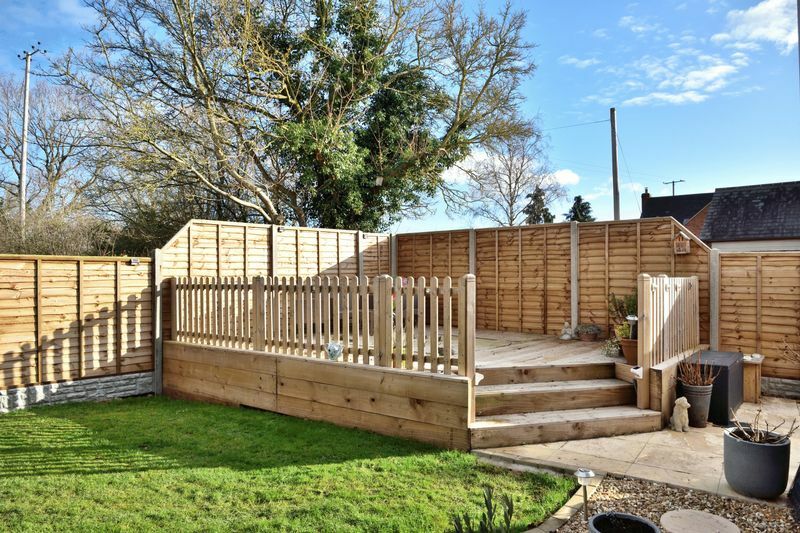 The plot is very well presented, framed by a wooden fence and established hedging, plants and specimen trees. 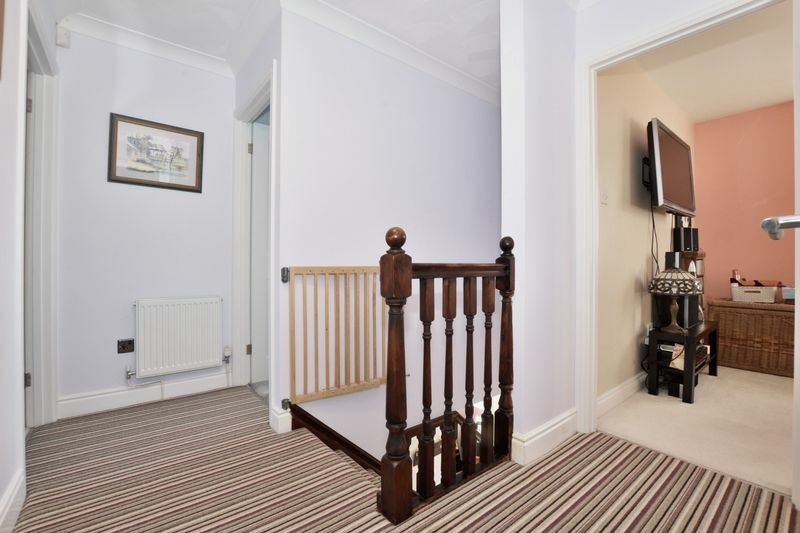 Hallway – The modern front door with open rain porch leads through to a welcoming entrance hall. 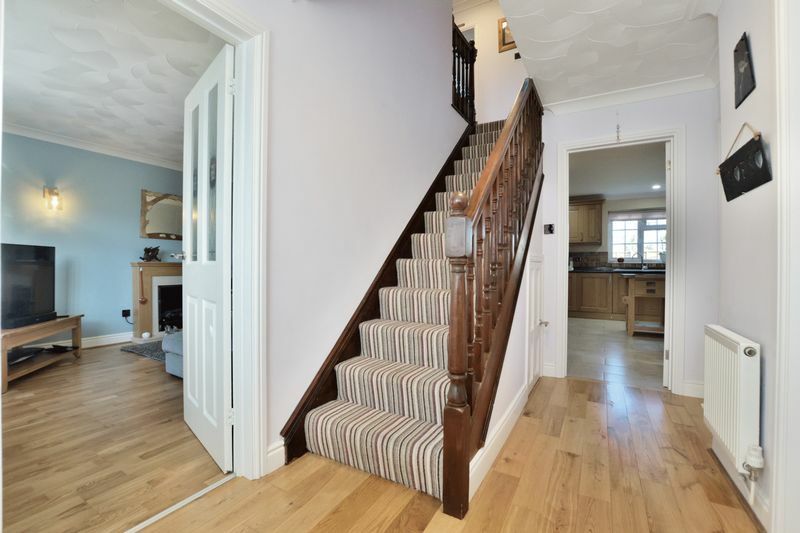 With stairs to the first floor landing, the hall flows conveniently to all the downstairs rooms. 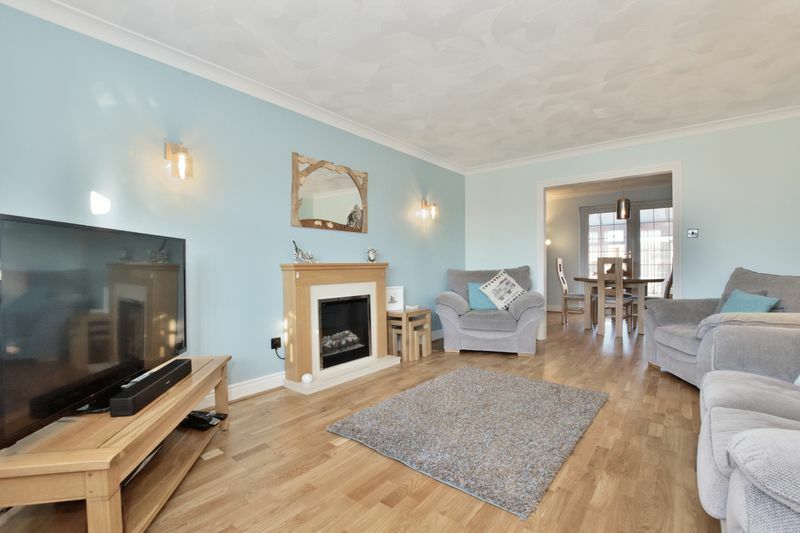 Sitting Room – To the left of the entrance hall the modern sitting room offers a sense of light and space, with a feature fireplace and wooden style flooring, the room leads naturally through an archway into the dining area. 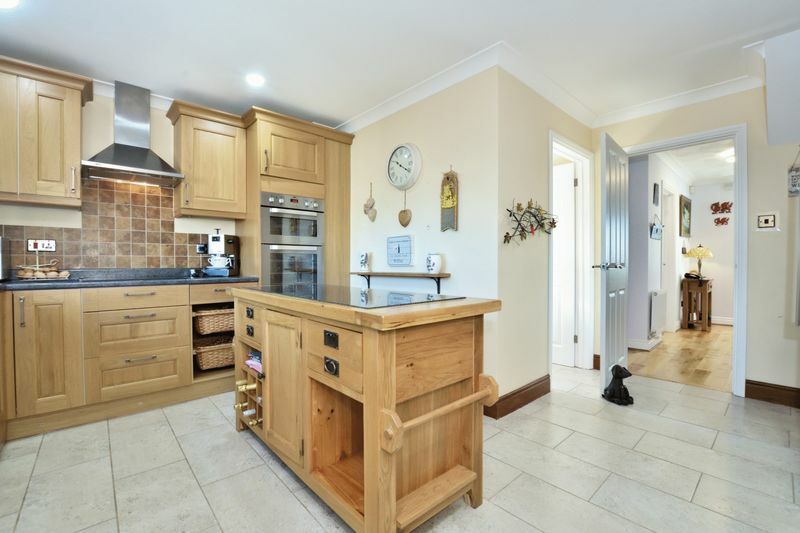 Dining Room – A light and comfortable room with space for a six seating table, a convenient entertaining space for parties or family gatherings the dining room leads straight through French doors to the sunroom, which in turn takes you to the pretty landscaped garden. 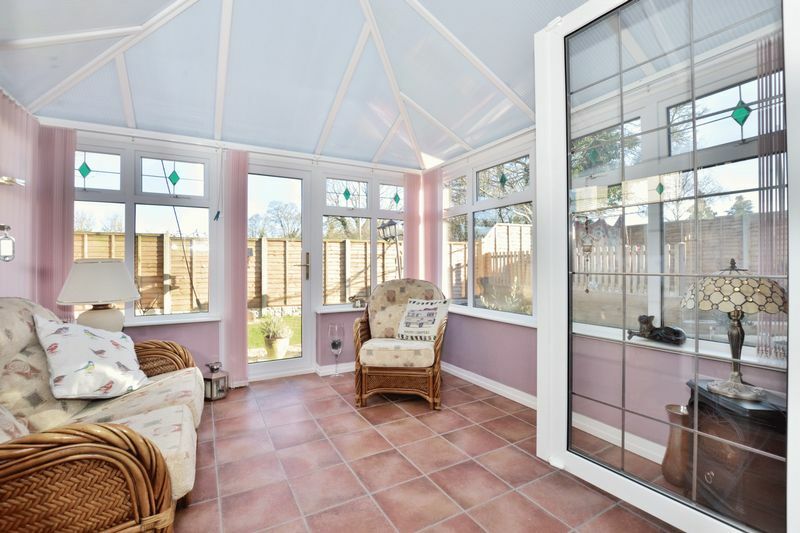 Sunroom – Flooded with natural light and a perfect space for entertaining or relaxing, the Sun Room opens out to the rear garden, creating a perfect flow between inside and outside living. Kitchen/Breakfast Room – A tastefully designed kitchen with an abundance of storage, benefitting from an integral double oven at eye level, halogen hob and space to accommodate an American style fridge/freezer as well as an integral dishwasher and drinks fridge, with plenty of space for a kitchen island or table and chairs and pleasant views out to the landscaped gardens and fields beyond. 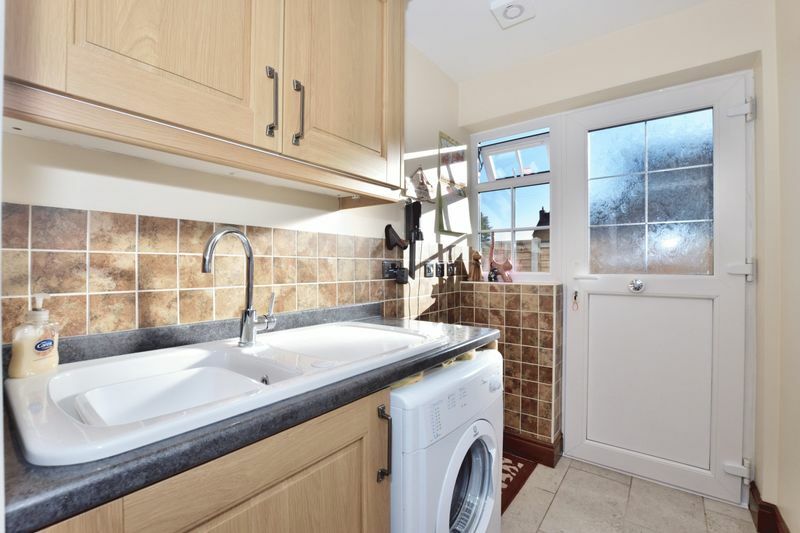 Utility Room – Situated through a door from the kitchen and offering a practical space with room for white goods and a sink, a door leads out to the side of the house making it perfect for pets and muddy boots. 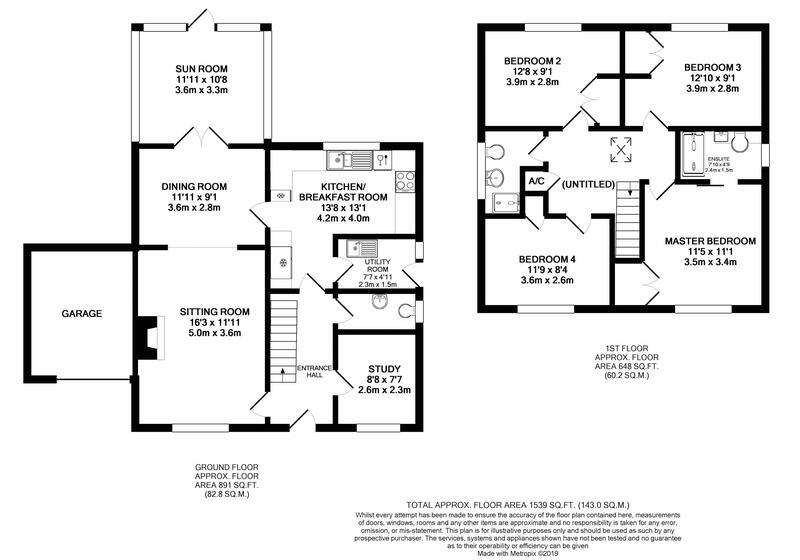 Study – An additional reception room which is well proportioned and offers the convenience to work from home, or as extra space for family living. 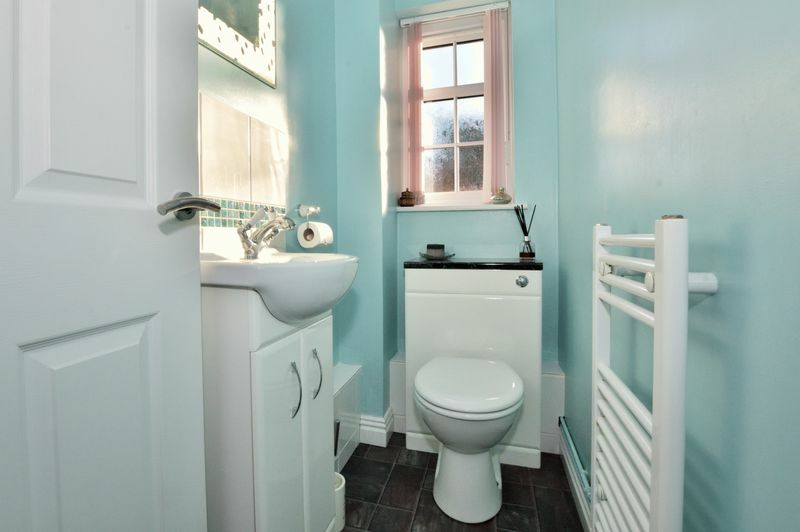 Downstairs Cloakroom – Just off the hallway a practical and well presented cloakroom with washbasin and W.C. The stairway opens up to a galleried landing with all bedrooms leading off it, with a glass roof lantern, giving access to the roof. 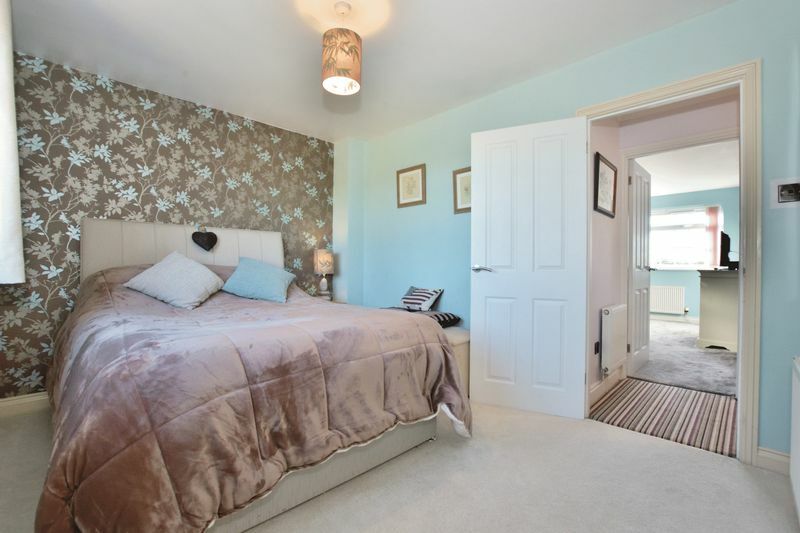 Main Bedroom – A bright, good size bedroom suite, with an impressive fitted wardrobe and a contemporary glass sliding door leading to a modern en-suite with double shower, wash basin with fitted vanity storage unit and mirror, W.C. and heated towel rail, all with neutral colour modern molded splash backs. 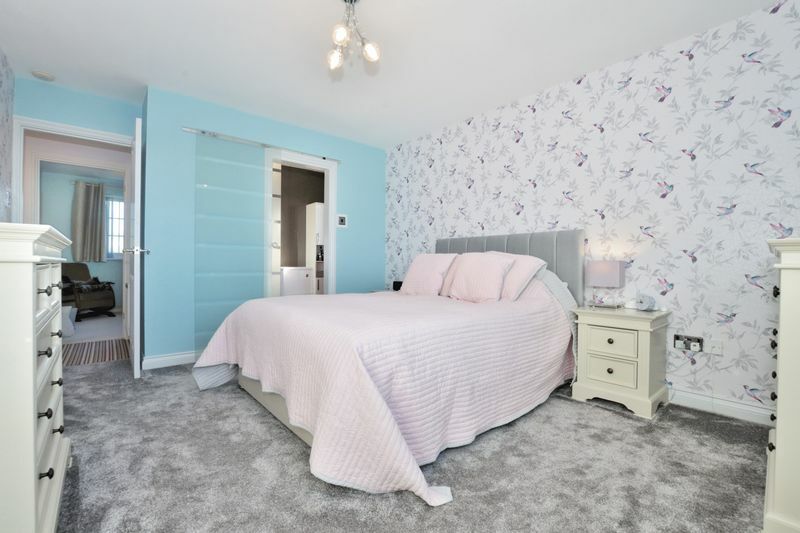 Bedrooms 2 & 3 – Overlooking the rear garden with open countryside views, both double bedrooms benefit from fitted wardrobes and are bright and welcoming. 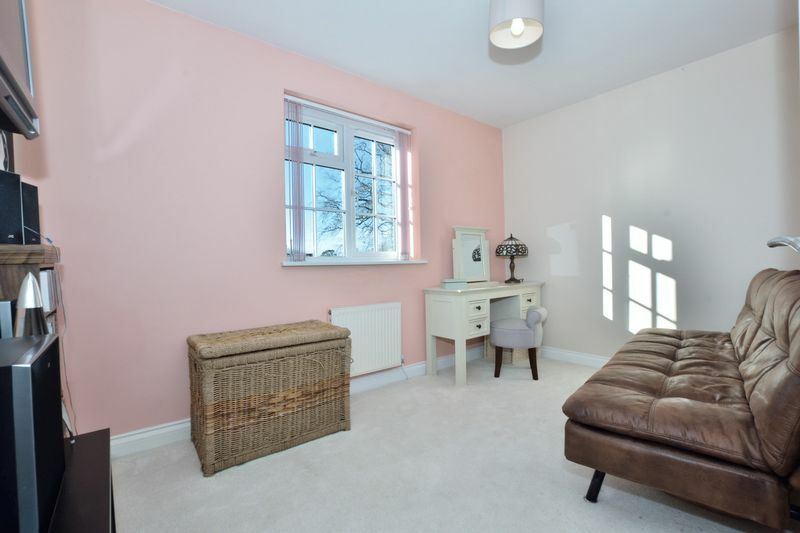 Bedroom 4 – Currently used as a guest room with a pull out sofa bed, this room overlooks the front of the property, towards the pretty church, lake and beyond and also benefits from a fitted wardrobe. 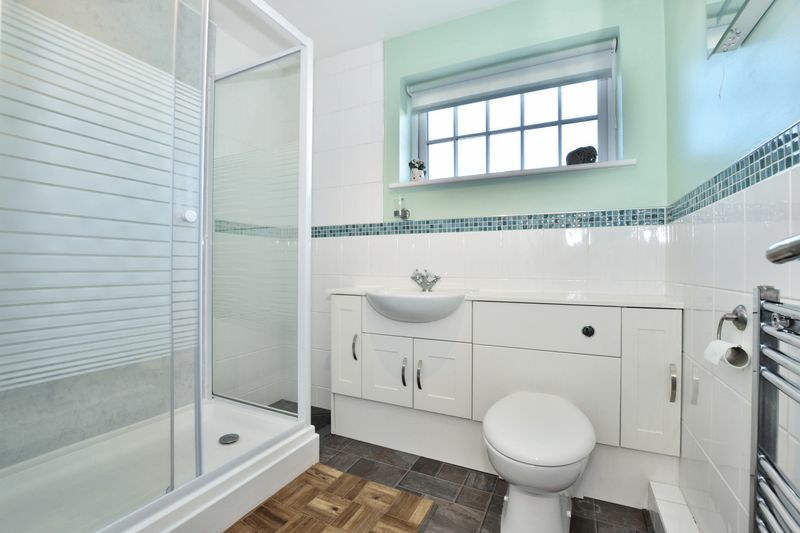 Family Shower Room – A convenient, modern shower room with double shower unit, molded vanity washbasin and W.C.
Set in the middle of its own plot, this individual property offers an abundance of space to the front of the house as well as a pretty landscaped garden to the rear with a raised deck, it feels both private and secure, ideal for children and pets. 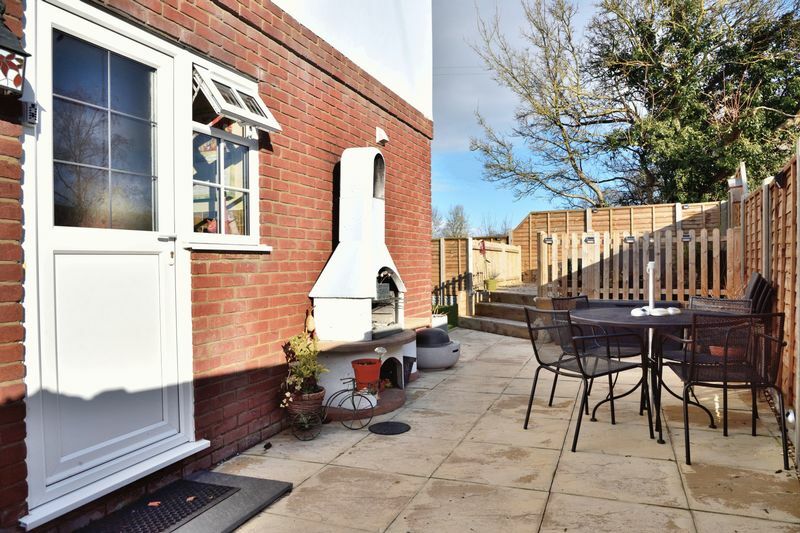 In addition a surprisingly spacious patio area to the side of the property is perfect for al fresco dining, with a Mediterranean style clay oven to take advantage of during the summer months. Altogether New Cross House offers versatile outside space for most situations. From Ledbury direction, take the A417 towards Gloucester and the M50. Pass over the M50 and continue for another 1½ miles take the second left signposted to Pendock & Lowbands. 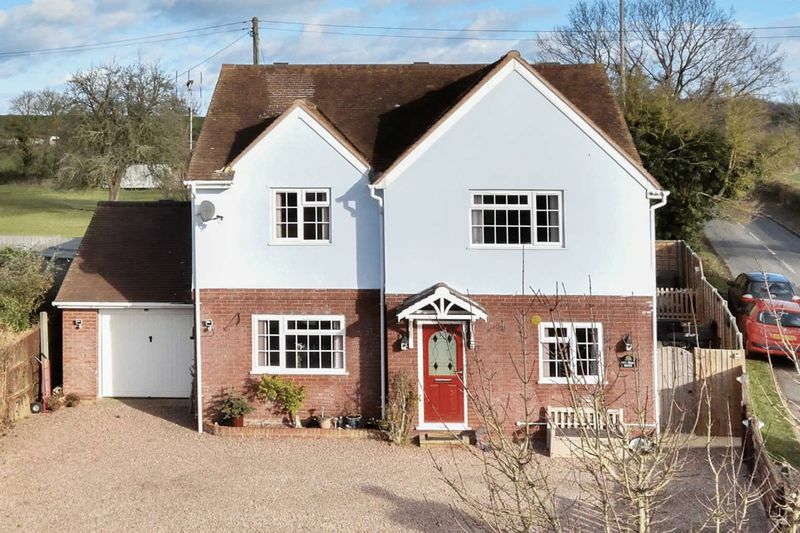 After approximately 1 mile at the Pendock Cross continue over the road and New Cross House can be found immediately on your left hand side, indicated by our For Sale sign.